Norwalk’s Ajsa Vega shoots over Darien defenders during Tuesday’s game at Darien High School. 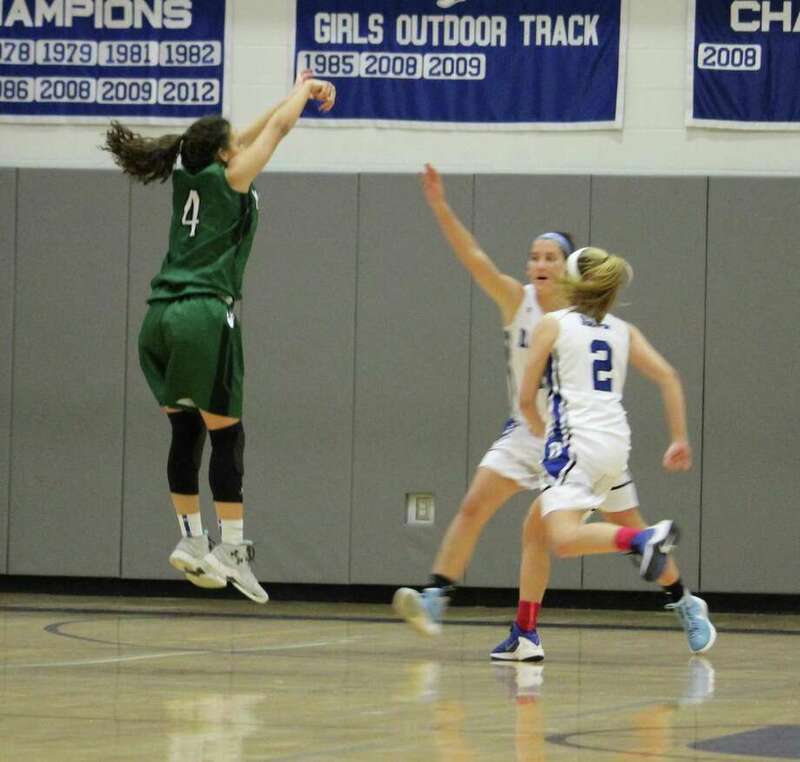 DARIEN — Down seven points at halftime, the Norwalk girls basketball team came into the second half with one thing on its mind. The Bears held Darien to just one point in the third quarter, and paired with second-chance opportunities and timely late buckets Norwalk rode that defense to a 56-46 win over the Blue Wave in Darien on Tuesday. Early in the game Darien kept up with the formula that had it coming into Tuesday’s tilt at 2-0 — transition offense and a menacing presence down low. Fueled by forward Katie Ramsay and her 10 first-half points, Darien was able to take a 31-24 lead into the half. In the third, however, Ramsay (14 points) found herself in foul trouble and had to sit, opening the door for the Bears’ 12-1 third-quarter run. Norwalk (1-2) was able to connect thanks to its offensive rebounding creating multi-shot possessions. With 3:30 left in the third Amanda Beckwith (six points) connected on a long 2-pointer to put her team within one, and two minutes later Ashley Wilson (14) hit a triple to give her team a 34-32 lead it would never relinquish. In the fourth Darien was able to regain some offensive flow, but never got to within eight points as late layups from Norwalk’s Beckwith, Wilson and Ajsa Vega kept the game out of reach for the Blue Wave. For the first time in the young season, an underclassmen-led Darien team showed its inexperience. Dunn, however, thinks his girls will be better for it. Amanda Beckwith 3 0-0 6 Ajsa Vega 2 4-5 8 Jackie Harris 2 0-1 4 Asiah Knight 6 2-3 14 Ashley Wilson 6 0-1 14 Tomeisha Barrett 0 2-4 2 Sanaa Boyd 2 1-2 6 Sarah St. Surin 1 0-0 2. Totals: 22 9-16 56. Ashley Humphrey 1 3-5 5 Gwen Dolce 0 2-2 2 Lindsay Dimonekas 2 2-2 7 Rachel Stabbie 0 0-2 0 Katie Ramsay 4 6-6 14 Christine Fiore 3 6-10 12 Hailey King 2 0-0 6. Totals: 10 19-27 46. 3-pointers: N—Wilson 2, St. Surin; D—Dimonekas, King 2.